Fawley oil refinery, operated by Esso, is one of the largest of its kind in the UK. Image courtesy of Peter Facey. The Fawley refinery processes about 330,000 barrels of crude oil a day, to produce nearly 20% of the UK's fuel requirement. Image courtesy of Gordon James Brown. The Fawley refinery has 330 storage tanks. Image courtesy of David Martin. 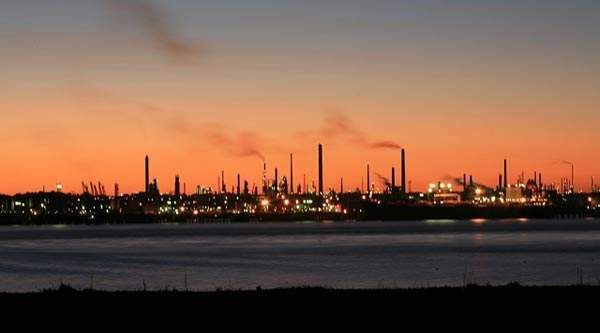 The Fawley oil refinery and chemical plant occupy 3,250 acres on the west shore of Southampton Water. Image courtesy of Tony Grant. Fawley Refinery and Petrochemical Plant, located in Fawley, Hampshire, is the largest integrated facility of its kind in the UK. It was opened in 1951. The facility processes about 330,000 barrels of crude oil a day (15mtpa). It is equivalent to 20% of the UK’s refining capacity. The annual output from the complex is about 850,000t in fuel oil, jet fuel, diesel, petrol and lubricating oil, plus several other chemicals. The Fawley refinery is operated by the Esso Petroleum Company and the chemical plant is operated by ExxonMobil Chemical, subsidiaries of ExxonMobil. The refinery and petrochemical plant together employ nearly 2,300 people. The Atlantic Gulf and West Indies Company established the refinery in 1921. The Fawley site was chosen for its readily available land, seawater for cooling (about 1.8 million t/day drawn from Southampton Water) and its proximity to the Southampton Docks. The Solent location also enables transportation of the crude oil and end products by sea. The plant was acquired by Esso in 1925. The complex was rebuilt and expanded in 1951. The refinery and adjacent petrochemical plant are located on a 3,250-acre site on the west shore of Southampton Water. The 1.5km marine terminal has nine berths, which handle the movement of 2,200 ships and 22mt of chemicals and crude oil per annum. The key units at the Fawley complex include a distillation unit, vacuum distillation, steam cracker, fluid catalytic cracker, catalytic reformer, residfiner and hydro desulphurisation units, gas recovery units and chemical processes, plus feedstock storage facilities. The site has about 330 giant tanks. About 70 supply, utility and service pipelines, which equal an overall length of 270km, support the operations. A £60m combined heat and power (CHP) plant was installed at the site in 2000. The 130MW electrical and 150MW thermal unit from Innogy reduces the carbon emissions. Crude oil from the tankers is unloaded and pumped into one of the 330 storage tanks with a capacity of 21,000 cubic metres. It is refined to produce industrial and consumer products through separation, conversion and purification processes. The separation involves distillation in the columns, with temperatures ranging from 320°C to 370°C. Atmospheric residue is further heated to about 400°C to increase the recovery of liquids. In the conversion, low-value fuel oil is processed to produce petrol, LPG and diesel, aromatics, paraffins (using fluidised a catalytic cracking unit (FCCU)), isomerisation and powerformer units. The purification process involves removal of sulphur through hydrofining for the products, in order to meet environmental and quality standards. Sulphur is also recovered as a by-product. The refinery processes about 20 different crude oils a year. It produces petrol (28%), diesel (29%), fuel oil (11%), kerosene and jet fuel (11%), LPG (three percent), lubricant base oils (three percent), petrochemical feedstock (nine percent), bitumen (one percent) and other products (five percent). About 80% of the output from the Fawley Refinery is transported via 750km of an underground pipeline network across the UK. It can transfer about 25 million litres of product a day. About 15% is exported by sea and the remaining five percent by rail and road. The heavy naphtha and gas oil feedstock from the refinery are used as feedstock for the integrated ExxonMobil Chemical plant. It produces ethylene, propene and butene. Ethylene is exported directly, while butene and propene are used as feedstock for the isobutylene plant and higher olefins plant. Main products from the plant are methyl ethyl ketone (MEK), halobutyl rubbers, lubricating base oils, speciality chemicals and additives. Butene is also imported and stored in ‘Seven Sisters’, seven pressurised spheres at the chemical complex. About 90% of the chemicals are exported. A major revamp of the FCCU and associated polymerisation facilities was completed by Foster Wheeler in 2001. The £70m FCCU Olefins Project was revamped with a new 900t reactor, to increase the production of chemical feedstock and decrease operational costs. In February 2003, AMEC was awarded a five-year contract for providing engineering maintenance services for both the facilities. In the same year, Foster Wheeler Energy was awarded a five-year contract for FEED and EPC of Fawley sulphur free mogas (FSFM) project. STP&I, D2A Engineering & Construction and The Companion Group were the subcontractors. ExxonMobil preserves a salt marsh, lying at the edge of the refinery site, which is home to 20 bird species. The Esso Petroleum Company, however, was fined £10,000 in September 2011 for leakage of about 400gal of vacuum gas oil into an environmentally sensitive Hampshire estuary. The leak was due to a corrosion hole in the oil transfer pipeline. Similar cases were reported in 2005 and January 2010. Esso spent about £150,000 for cleaning the pollution and carried out inspection of its entire pipeline and assured it would conduct checks regularly.